1. Preheat the oven to 140°C, gas mark 1. Line a large baking sheet with baking parchment and mark out 6 x 10cm circles (draw around a biscuit cutter). Using electric beaters, whisk the egg whites to stiff peaks. Gradually beat in 200g sugar, whisking it back to stiff peaks after each addition. Add the cornflour and vinegar and whisk briefly, until combined. 2. Divide the mixture between the 6 circles on the baking parchment, making a shallow dip with the back of a spoon in the middle of each. Bake for 1 hour on the lowest shelf of the oven, then remove and allow to cool completely on the tray. 3. Meanwhile, turn the oven up to 200°C, gas mark 6. Put the rhubarb on a baking tray and sprinkle over 2 tbsp elderflower cordial and the remaining 45g caster sugar. Toss together and cover with foil. Roast for 10 minutes, until tender. Allow to cool a little. 4. For the filling, use a balloon whisk to whip the cream and remaining 80ml elderflower cordial together to soft peaks. 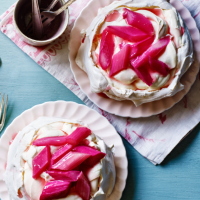 Divide between the meringues, top with the roasted rhubarb and drizzle with the rhubarb cooking juices to serve.